This fine single-origin Bolivian coffee is crisp, with a syrupy, honey-toned sweetness marked by notes of cacao, spice, and a juicy plum acidity. Perched atop fertile mountain ridges in the foothills east of the Andes, 300 farming families produce one of Bolivia’s sweetest coffees under the shade of lush jungle canopy. 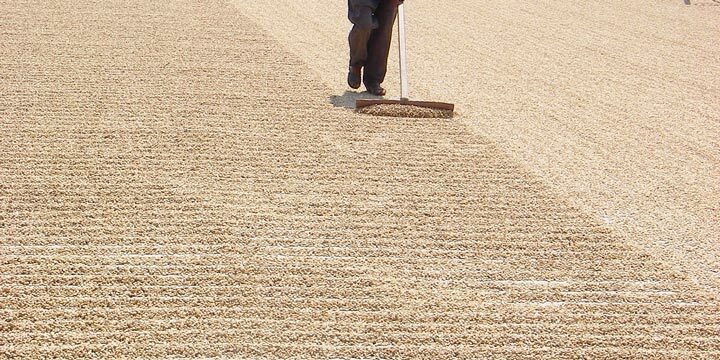 These farmers are members of ASOCAFE, a cooperative founded in 1990 in an effort to improve the quality of the area’s coffee and, consequently, price and income for farmers. Caranavi province is the heartland of Bolivia’s organic coffee production. Rivers that flow from glaciers 4,000 meters above carve deep valleys and create an ideal landscape for the cultivation of exquisite coffee. The coffee farmers of ASOCAFE grow prized varietals on their small farms and transport their carefully hand-picked coffee to central processing stations, where, under the watchful eye of the cooperative’s staff, the ripe cherries are depulped, fermented, washed, and sun-dried. 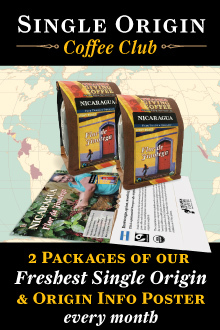 Fair Trade and Organic coffee from Bolivia. Available in Whole Bean or Ground: auto drip, french press, espresso or percolator. From Mary Fouts of Pleasant Hill, California on 3/13/2015 . 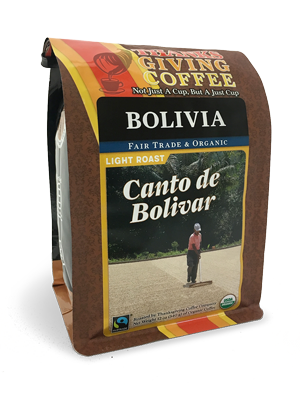 I recently ordered Canto de Bolivar Bolivian beans at the recommendation of Susan Coy, who knows my preference for light roast beans. Wow, another winner! These beans are truly a coffee lover's coffee. 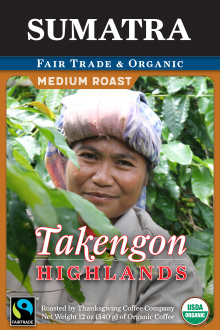 An outstanding coffee flavor with notes of caramel and chocolate. Wonderful with a bit of cinnamon stick ground with the beans, and a splash of milk in your cup. Surely will also please those who prefer a darker roast. Try this! From Michael Laster of Mountain View, California on 5/31/2013 . I prefer dark roast/bold beans usually. When I received the Bolivian beans I was worried. They looked like the usual medium roast, which for me usually does not have the taste I like. Surprise ... this coffee is wonderful. Very bold, full flavored and smooth. 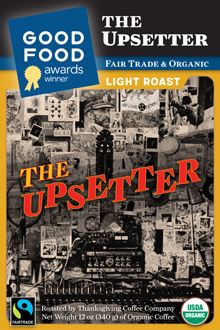 I will add it to my regulars:Mirembe Kawomera, Uganda - Dark Roast, End The Embargo Dark and Permata Gayo, Indonesia - Dark Roast (which has been up and down in quality a litle over the past 2 years).